8.2 Governors request federal funding for "clean coal"
Wyoming is the nation's largest coal producer, with over 400 million tons of coal produced in the state each year. In 2006, Wyoming's coal production accounted for almost 40% of the nation's total coal production. Currently Wyoming coal comes from four of the state's ten major coal fields. The Powder River Basin Coal Field has the largest production in the world - in 2007, it produced over 436 million short tons. Wyoming coal is shipped to 35 other states. The coal is highly desirable because of its low sulfur levels. On average, Wyoming coal contains 0.35 percent sulfur by weight, compared with 1.59 percent for Kentucky coal and 3 to 5 percent for other eastern coals such as West Virginia. Although Wyoming coal may have less sulfur, it also has a lower "heat rate" or fewer Btu's of energy. On average Wyoming coal has 8600 Btu's of energy per pound, while eastern United States coal has heat rates of over 12,000 Btu's per pound, meaning that plants have to burn 50 percent more Wyoming coal to equal the power output from Eastern coal. Powder River Basin Coal Beds. In 2003, Wyoming produced 127 million metric tons of carbon dioxide emissions, ranking it 31st in the nation overall, but 1st on a per capita basis. Wyoming's coal-fired power plants emit more CO2 in eight hours than the power plants in more populous Vermont do in one year. Coal was discovered in Wyoming by the Fremont Expedition of 1843. Commercial mining began with the arrival of the railroad. The first mines were located in Carbon and Rock Springs and were owned by the Wyoming Coal and Mining Company. When the railroad was relocated in 1899 to avoid a steep grade, the Carbon mines and the town around them were abandoned. Nearly 90 percent of the stock in Wyoming Coal was held by heads of the Union Pacific. Wyoming Coal leased the land from the railroad, and then sold their coal to the railroad for a profit. In 1874 a government investigation terminated the agreement between the two companies, at which point Union Pacific took over the mines. By controlling the only means of transporting coal, the Union Pacific established a monopoly on coal production. Several strikes occurred in the early history of Wyoming coal mining. In 1875, Union Pacific cut miners' pay by 20 percent but made no corresponding reduction in coal prices. When the miners went on strike, the company replaced them with Chinese workers, leading to the Rock Springs Massacre of 1885. Striking miners burned the homes of approximately 75 Chinese families, killing 28 Chinese workers and injuring 15. Federal troops were brought in to restore order in the town and remained there until 1898. Another strike occurred in 1894 when the Pullman Company laid off a third of its employees and lowered the pay of the remaining workers. Railroad workers went on strike until the federal government intervened to break up the strike and ordered that more than 800 railroad employees in Wyoming be fired. Wyoming has had numerous mine disasters. The worst occurred in Hanna on June 30, 1903, when an explosion in one of Union Pacific's mines killed 169 miners. Union Pacific paid $800 to each widow and $50 for each surviving child younger than fifteen. Nine other disasters between 1886 and 1924 killed 328 people. In the summer of 2009 the Dakota, Minnesota & Eastern Railroad began to abandon a massive rail expansion project in the Powder River Basin, which is located in southeast Montana and northeast Wyoming. The region supplies 40 percent of the total coal production in the United States and the railroad project was set to expand the company's operations into the area to transport coal to regional coal-fired power plants. The economic downturn and rise in climate change awareness are noted as the reasons that led to the decision to back off the plan. Nonetheless, no decision has been made to permanently shelve the project. In November of 2009 the bank HSBC released a report entitled, "The Green Side of Black" that made estimates about coal's involvement in the future of the U.S. energy economy. In it, the bank reported that coal, even under cap-and-trade legislation, will be a lucrative industry in the future. The author of the report also stated that Wyoming's Powder River Basin will be growing faster than any other coal regions in the United States. The HSBC report stated that Arch Coal and Peabody Energy will be especially prosperous because of their extensive involvement in the Powder River Basin. In 2009 Wyoming coal production dipped 8.5 percent compared to 2008. As of June 2010 Wyoming production was down 2.8 percent compared to the same time in 2009. A study released in July 2010 by the Civil Society Institute argued that it was technically and economically viable to retire all coal and nuclear based power in seven Western states, including Wyoming. The region covered in the study was said to have enough renewable sources of energy and, combined with energy conservation measures, the transition away from coal and nuclear could take place within 30 years time. In this scenario, according to the Civil Society Institute study, the entire Northwest could retire 11,000 megawatts of coal-fired power and add at least 12,000 megawatts of onshore wind power. According to a study conducted by Headwaters Economics based in Montana entitled "Fossil Fuel Extraction and Western Economics" reported that Wyoming coal production accounted for 24% of the total mining employment in the state in 2008. Oil and natural gas accounted for a combined 72% for the same year. On March 5, 2010 the Powder River Basin Resource Council and Sierra Club lost a case in the Wyoming Supreme Court where the groups had challenged an air quality permit that the Wyoming Department of Environmental Quality issued for the Dry Fork Station in 2007. The plant is closing in on 75 percent completion rate as of March 2010. The Supreme Court ruling lifts one of the last remaining obstacles for the plant's completion. The plant's $1.3 billion cost includes $334 million in pollution-control equipment, commonly known as scrubbers. The groups involved in the suit claimed the plant could degrade air quality the Northern Cheyenne Indian Reservation in southern Montana. The plant is to be located 60 miles south of the reservation. The environmental groups argued that worst-case computer modeling showed the plant's emissions, combined with emissions from existing plants in Montana, could cause high levels of pollution for those living on the Northern Cheyenne reservation. However, the justices on the Wyoming Supreme Court ruled that the state regulators granted the permit correctly. On February 8, 2011, the U.S. Bureau of Land Management (BLM) denied a petition brought by WildEarth Guardians and the Sierra Club to change its process for selling access to the nation's most productive coal deposits. Since 1990, the government has allowed the coal industry to nominate deposits it wishes to mine in the Powder River Basin in northeast Wyoming and southeast Montana. Such deposits typically are located next to existing strip mines in the Powder River Basin. The groups contended that such a change would help create more competition for the leases while improving oversight of coal's contribution to climate change. The groups also asked the government to impose a "carbon fee" on new coal leases to reimburse the BLM for addressing how coal leasing affects global warming. The BLM denied the requests. It was announced on August 23, 2011 that three environmental groups are suing the Bureau of Land Management over the agency's decision to allow Alpha Natural Resources to mine a tract at the Caballo Mine containing 130.1 million tons of coal for $143.4 million along with one other lease the BLM approved, including the Belle Ayr Mine tract which contains 130.1 million tons of coal and is operated by Peabody Energy. WildEarth Guardians, Sierra Club and Defenders of Wildlife. The groups contended the BLM did not properly conduct its assessment of the environmental impacts of the proposed operation. The groups contend that the coal from the tracts is enough to fuel 152 coal-fired power plants and would release 643 million tons of carbon dioixide, or the same amount as that released by 111.7 million passenger vehicles a year, using EPA calculations. On December 6, 2011 WildEarth Guardians, the Powder River Basin Resource Council and the Sierra Club filed a lawsuit opposing a U.S. Forest Service lease of coal in Wyoming’s Powder River Basin. The groups are opposing the agency’s agreeing to plans to lease the South Porcupine coal tract, portions of which are in the Thunder Basin National Grassland. The five-square-mile tract holds 402 million tons of coal and would be likely to expand the adjacent North Antelope Rochelle Mine owned by St. Louis-based Peabody Energy. The groups claim that the Forest Service’s decision threatens the ecology and both recreational and economic resources of the grassland. In May 2012, coal activists in Wyoming said they were planning a number of confrontational civil disobedience protests throughout the summer against coal mines in the Powder River Basin. The group, dubbed West By Northwest, set up an action camp near Cheyenne that would be a "place to build constructive solutions to preventable human and environmental catastrophes related to coal exports." The goal of the protests, said a High Country Rising Tide leader associated with organizing the events, is to interrupt business at the mines with “arrestable” activities. However, in early July 2012, it was announced that the protests were canceled due to a lack of readiness for the event. Rising Tide, the organizer for the canceled protests, said they were shifting their resources to support opposition against the Montana Land Board in Helena and development of the Otter Creek coal mine. 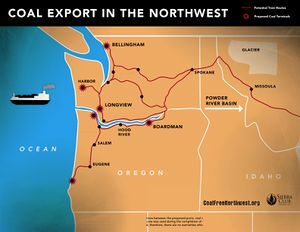 On May 29, 2012 the Seattle City Council unanimously passed a resolution opposing the development of coal-export terminals in Washington state after raising concerns about increased train traffic and potential harm to health and the environment. That coal would be mined in the Powder River Basin. On August 13, 2012 protesters opposed to coal development in Montana occupied the state Capitol in Helena, the first day of a week-long protest aimed at elected officials to push them to block future development leases. The protesters, led by a Missoula based group called the Blue Skies Campaign, billed the "Coal Export Action sit-in" as a non-violent protest. The group hopes to convince the Montana Land Board to reject development of coal in eastern Montana's Otter Creek, or at a minimum delay action on the issue while more studies are undertaken. Seven activists were initially arrested but others vowed to continue their actions. However, by the end of the first week of protest a total of 23 activists were arrested. In November 2008, the Department of Energy awarded $66.9 million to the Big Sky Regional Carbon Sequestration Partnership to develop the Department’s seventh large-scale carbon sequestration project. The project will conduct a large-volume test in the Nugget Sandstone formation in Wyoming in an effort to establish the possibility of "safely, permanently and economically" using a geologic formation to store over 2 million tons of carbon dioxide. The DOE is currently estimating the project's cost at over $130 million. Big Sky plans to drill a CO2 injection well and inject up to one million tons per year of carbon dioxide at a depth of 11,000 feet. The DOE states that similar geologic formations in the region offer the opportunity to store more than 100 years of CO2 emissions from sources in the area. The CO2 for the project will come from Cimarex Energy’s proposed helium and natural gas processing plant at Riley Ridge. On December 16, 2009 it was announced that the University of Wyoming (UW) teamed up with four companies, including Exxon-Mobile, to begin the so-called Rock Springs Uplift and Moxa Arch carbon sequestration projects. UW researchers believe that these two sites are capable of storing Wyoming's annual CO2 emissions for many centuries. The companies involved believe that carbon sequestration will help to keep the coal industry viable under pending federal and state carbon control regulations. In March of 2010 Wyoming Governor Dave Freudenthal stated he was hopeful that the University of Queensland and University of Wyoming would be teaming up in the future to research carbon sequestration technology. Queenslannd produces 80 to 90 percent of Australia's coal. On August 18, 2010 it was announced that researchers at the University of Wyoming received a $1.5 million federal grant from the Dept. of Energy to study carbon capture technologies. The school was one of 15 to receive federal money for such research. The study will be conducted in southwest Wyoming's Rock Springs Uplift. Earlier published reports on the potential for sequestration fail to address the necessity of storing CO2 in a closed system. Our calculations suggest that the volume of liquid or supercritical CO2 to be disposed cannot exceed more than about 1 percent of pore space. This will require from 5 to 20 times more underground reservoir volume than has been envisioned by many, including federal government laboratories, and it renders geologic sequestration of CO2 a profoundly non-feasible option for the management of CO2 emissions. Injection rates, based on displacement mechanisms from enhanced oil recovery experiences, assuming open aquifer conditions, are totally erroneous because they fail to reconcile the fundamental difference between steady state, where the injection rate is constant, and pseudo-steady state, where the injection rate will undergo exponential decline if the injection pressure exceeds an allowable value. The implications of our work are profound. They show that models that assume a constant pressure outer boundary for reservoirs intended for CO2 sequestration are missing the critical point that the reservoir pressure will build up under injection at constant rate. Instead of the 1-4 percent of bulk volume storability factor indicated prominently in the literature, which is based on erroneous steady-state modeling, our finding is that CO2 can occupy no more than 1 percent of the pore volume and likely as much as 100 times less. We related the volume of the reservoir that would be adequate to store CO2 with the need to sustain injectivity. The two are intimately connected. The United States has installed over 800 gigawatts (GW) of CO2 emitting coal and natural gas power plants. In applying this to a commercial power plant of just 500 MW, which by the way produces about 3 million tons per year relentlessly, the findings suggest that for a small number of wells the areal extent of the reservoir would be enormous, the size of a small U.S. state. Conversely, for more moderate size reservoirs, still the size of the U.S.'s largest, Alaska’s Prudhoe Bay reservoir, and with moderate permeability there would be a need for hundreds of wells. Neither of these bode well for geological CO2 sequestration and the work clearly suggests that it is not a practical means to provide any substantive reduction in CO2 emissions. In June 2010 it was announced that Wyoming Oil and Gas Conservation Commission set a July 1, 2010 deadline for the Wyoming Consolidated Gas Corp. to bring 42 of the company's abandoned coalbed methane wells on state lands into compliance. It is purported that plugging the old wells will decrease the amount of coalbed methane water the flows they discharge. It has been suggested that a ban on coalbed methane wells would save 3.3 billion barrels of groundwater in the Powder River Basin. In September 2011 High Plains Gas, Inc reactivated its wells that produce coalbed methane in the Powder River Basin's Fitch Field. In the past the company produced 800 million cubic feet per day with its wells in Fitch Field. Following Tennessee Valley Authority's proposed closure of the Johnsonville Fossil Plant in Tennessee, as part of an EPA settlement in April 2011. One million tons of Powder River Basin coal is burned in the plant each year. The closure will phase out 2,700 megawatts of Tennessee Valley Authority’s 17,000 megawatts of coal-fired capacity by 2017. Coal industry lobbyists have proposed three draft bills in response to a request from state lawmakers about how to make Wyoming more competitive in luring "clean coal" projects. Each bill would cut taxes. One would apply to sales and use taxes, another to ad valorem taxes, and another to severance taxes. The draft bills went to the Joint Minerals, Business and Economic Development Interim Committee for consideration on November 18, 2008. In early 2010 the Wyoming Legislature appropriated $45 million in federal Abandoned Mine Land funds to the University of Wyoming for continued work on carbon sequestration. Researchers from the university are seeking additional funds to continue their studies. In February 2011, Wyoming Governor Matt Mead filed a legal challenge to the U.S. EPA's decision to override states that were unable or unwilling to enforce permits for the largest sources of greenhouse gas emissions. Gov. Mead argued EPA didn't allow enough time for Wyoming to meet new requirements before enforcing its federal plan that took effect on January 2, 2011. The Wyoming attorney general's office filed three petitions with the 10th U.S. Circuit Court of Appeals in Denver before the Feb. 11, 2011 deadline to challenge the agency rules. Governors request federal funding for "clean coal"
On February 22, 2009, the governors of Wyoming, Colorado, and Utah submitted a letter to President Obama asking for funding to develop "clean coal" projects in their states. Wyoming Gov. Dave Fruedenthal, Colorado Gov. Bill Ritter, and Utah Gov. Jon Huntsman, argued that developing a cleaner way to burn coal is essential to reducing emissions, protecting national security, and creating new jobs. The letter also said that the Energy Policy Act of 2005 approved federal cost sharing for a clean-coal demonstration project using coal mined in the West, but that no project was ever funded. 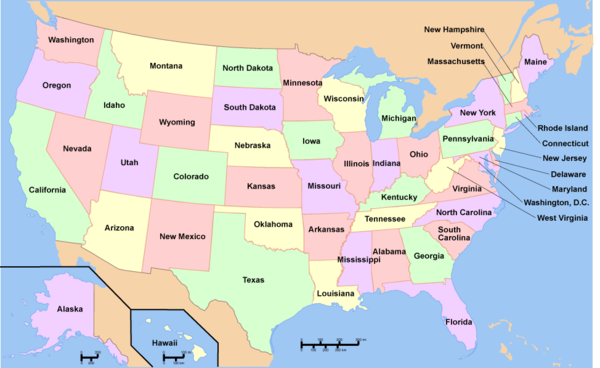 According to the governors, the three states are ready to start developing new demonstration projects and retrofitting existing plants with carbon capture and storage technologies. On September 30, 2011 a federal judge approved a deal requiring the Environmental Protection Agency to finalize by plans to reduce haze-causing pollution from coal-fired power plants and other sources in four Western states by 2012. The Environmental Defense Fund, WildEarth Guardians and National Parks and Conservation Assocation sued the EPA for failing to address haze-causing emissions, which are required under the Clean Air Act in Montana, Wyoming, Colorado and North Dakota. In July 2012 it was reported that the 2012 federal highway-funding and student-loan bill would slash funds Wyoming gets for coal-mine cleanup, money that reportedly has been used for unrelated projects. To help offset some of Wyoming's spending, lawmakers reduced Wyoming's access to funds for the state's abandoned coal mines. The change will cost Wyoming about $700 million over 10 years. On August 1, 2012 a Federal District court judge in Washington, D.C. ruled against environmental groups WildEarth Guardians, the Sierra Club and the Powder River Basin Resource Council’s challenge to the BLM's decision to lease more than 400 million tons of coal to Cloud Peak Energy, the current operator of the Antelope Coal Mine in Wyoming. The case was the first in a series of lawsuits brought by the conservation groups over BLM’s coal leasing program in the Powder River Basin. The groups were disappointed with the decision but vowed to continue legal and other efforts to challenge BLM’s coal leases. In January 2009, Peabody Energy announced plans to reduce its yearly production of Powder River Basin coal production by 10 million tons because of the economic downturn and weakening demand worldwide. Peabody's three Wyoming coal mines, which include North Antelope Rochelle Complex, Caballo and Rawhide, produced a total of approximately 143.5 million tons in 2008. together produced about 143.5 million tons in 2008, according a Casper Star-Tribune estimate. North Antelope Rochelle accounted for almost two thirds of that total. The company, which employs over 1,700 miners in the state, does not expect a significant loss of jobs in spite of the production slowdown. Peabody Energy owns and operates the North Antelope Rochelle Mine in Wyoming, which is the largest surface coal mine in the United States. Of the 15 largest surface coal mines in the country, 11 are located in the state of Wyoming. It was announced in October 2010 that Peabody Energy was exporting production from its Powder River Basin mines to European markets. Peabody exports Powder River Basin coal through existing ports to Europe, Chile and Asia. It is also looking at building a large coal export facility in Oregon. Peabody has contracted 90% of its 2011 production from the Powder River Basin mines, but the company stated that it has coal volumes available for 2012 and 2013. In September 2011 Keith White, director of GE Energy’s coal gasification business stated, "We make a majority of our money in China today. They use their coal for quality high-end products." White said that leaders in Wyoming should continue their support of coal-gasification and keep in mind the need to expand to additional markets like plastics and other refined products. He noted that a high volume of coal in China is refined into liquid byproducts "such as naphtha, and other products that are the feedstock of plastics and the Chinese garment industry." In July 2011, it was reported that the port in Coos Bay, Oregon was considering coal exports. "We are in discussions with coal developers and have entered into nondisclosure agreements with those companies," Port of Coos Bay CEO Jeff Bishop. "We don't want anyone to be surprised." Bishop stated the arrival of one coal train per day would create 100 ship calls per year. However, coal exports would bring too many ships for the cargo terminal to handle, stated Bishop. "If any coal terminal is developed in Coos Bay, it would have to be a stand-alone terminal." On June 7, 2010 the University of Wyoming filed a minor source air permit with the Wyoming Department of Environmental Quality for a permit for the High Plains Gasification Advanced Technology Center, to be built near Cheyenne. The facility will test technology to turn coal into gas and will cost approximately $100 million to build. It was announced on July 29, 2011 General Electric and the University of Wyoming suspended plans for their joint $100 million clean coal research facility near Cheyenne, Wyoming amid uncertainty in the nation's energy policy. GE stated that lower natural gas prices and lower energy demand in the weak economy also played roles in shelving the project, which had reached the bidding phase. On April 1, 2010 it was announced that the newly constructed Wygen Unit 3 went officially online, several months earlier than expected. It was the first in the state of Wyoming to do so since 2008. The 100 MW plant will provide coal-fired electricity to approximately 70,000 residents in the states of South Dakota, Wyoming and Montana. The cost of the plant was $247 million. Critics of the plant in neighboring South Dakota, where Black Hills Power is requesting a rate increase, argue that the power the plant will produce for their community is not worth the extra increase in utility rates. In all the utility is asking for a 26.6 percent increase, or a total of $32 million. Rates could rise by more than 33% if the increase is approved by the State's Public Utilities Commission. Black Hills Power will receive the majority of the power the plant produces. In May 2010 the Wyoming Public Service Commission approved Rocky Mountain Power's proposal to raise utility rates for its Wyoming customers to help pay for the company's coal plant environmental improvements. Rocky Mountain Power is a subsidiary of PacifiCorp. The utility will increase the overall average consumer electrical rates by 5.1 percent in July 2010 and 1.9 percent in February 2011 to generate another $35.5 million per year. The company is expected to file for another rate increase later this year, which would result in new rates again at some point in 2011. Additionally, Wyoming Public Service Commission approved a proposal by Black Hills Power to increase their rates by 32 percent for its Wyoming customers in June 2010, which would affect a total of 2,700 in northeastern Wyoming. The utility stated that it sought the increase to pay for costs associated with Wygen Unit 3, and other generation, transmission and distribution investments. On April 6 2011, environmental groups announced that they are challenging the Obama administration's plan to lease federal coal reserves in the Powder River Basin. Three groups, which included the Sierra Club, Defenders of Wildlife and WildEarth Guardians filed a lawsuit in U.S. District Court that contested the federal leasing program for the land in Wyoming and Montana. The lawsuit stated that a 1990 decision to "decertify" the Powder River Basin as a coal producing region is no longer valid. The groups contend that the decertification has allowed the government to avoid environmental reviews on the climate change impact of burning coal. In January 2012 the BLM announced that they were going to also auction off the right to mine more than 400 million tons of coal in the Powder River Basin. The coal lease sale will be held on February 29, 2012 in Cheyenne, Wyoming. The 3,200-acre tract is adjacent to the North Antelope Rochelle Mine and operated by Powder River Coal, a subsidiary of Peabody Energy. The BLM says coal royalties in Wyoming last year totaled $590 million. The money was shared nearly equally between the state and federal governments, it was reported. The land is called the South Porcupine Coal tract, which is 3,243 acres. While BTU Western Resources, Inc.'s first bid for the land was rejected in early May 2012, another bid was later accepted on May 18, 2012 for $446 million. Since May 2011 BLM coal lease sales in Wyoming topped $1 billion. In June, 2011 Cloud Peak Energy signed a 10-year deal to ship basin coal to Asia from a port on Canada’s Pacific Coast. Cloud Peak Energy Inc. signed the deal with Westshore Terminals to ship coal through its Westshore Terminal in Vancouver, British Columbia. The company shipped 3.3 million tons of coal through the terminal to Asian customers in 2010. Cloud Energy operates the Antelope Coal Mine, Cordero Rojo Mine, Spring Creek Mine and Decker Mine in the Powder River Basin. It was announced in August 2011 that Alpha Natural Resources outbid Peabody Energy for a coal mining lease from the Bureau of Land Management in the Powder River Basin. An Alpha subsidiary bid $143.4 million for a tract containing 130.1 million tons of coal, inching out a Peabody subsidiary’s $127.6 million bid. Alpha agreed to pay $1.10 per ton of mineable coal which was a record for the Powder River Basin. The lease is located in a 1,024-acre area known as the Caballo West tract. Alpha's leased tract is situated eight miles southeast of Gillette, Wyoming between Peabody’s Caballo Mine to the north and Alpha’s Belle Ayr Mine to the south. In May 2012 the WildEarth Guardians and the Sierra Club filed suit against the U.S. Department of Interior in an attempt to stop the coal mining plans approved in the Powder River Basin by the BLM. The suit challenges four new coal leases in the Powder River Basin of northeastern Wyoming. The suit claims that the mining leases threaten to lead to more than 3.3 billion metric tons of carbon dioxide, which would be like cutting down more than 400 million acres of forest—an area roughly four times the size of Texas. The mining comes as atmospheric concentrations of carbon dioxide are greatly exceeding 350 parts per million, the level considered safe for humanity. In June 2012 it was announced that Cloud Peak Energy purchased Chevron and Consol's Powder River Basin (PRB) assets for $300-million. It was reported that "of the purchase price, $195-million was allocated to the lease of about 450-million tons of in-place coal and $105-million to the purchase and lease of 38 800 acres of land." On August 30, 2011 a mining accident occurred at the North Antelope Rochelle Mine in the Powder River Basin. The accident killed an employee of Weston Engineering, a water well drilling and hydrogeology consulting firm. The cause of death was not initially reported. According to a 2007 risk assessment report released by the EPA, Wyoming has 17 coal ponds at 5 coal-fired power plant sites. Of these ponds, 11 are over 30 years in age and 4 are over 40 years old. Additionally, four surface impoundments and landfills were reported as being unlined, and two that were clay-lined. Colorado Electric, Black Hills Power subsidiary, stated that they will suspend operations at a coal-fired unit in Rapid City, S.D. by August 31, 2012, and retire the plant in March 2014. The company also plans to retire plants near Gillette and Wyoming's Osage Power Plant, in March 2014. As of 2010 there were approximately 19 active coal mines in Wyoming with production of approximately 442,522 short tons per year. Eagle Butte Mine, Foundation Coal West, Inc.
Belle Ayr Mine, Foundation Coal West, Inc.
Wyodak Mine, Wyodak Resources Development Co.
Kemmerer Mine, The Pittsburg & Midway Coal Mining Co. In July 2012 Youngs Creek Mining company sold Cloud Peak Energy a $300 million parcel of undeveloped land near the Wyoming/Montana border that possessed a permit to extract coal. ↑ Wyoming Coal, accessed March 2010. ↑ The Coal Section, Wyoming State Geological Survey, accessed May 2008. ↑ Wyoming's Low Sulfur Coal, Wyoming State Geological Society, accessed May 2008. ↑ "How Coal Works", Union of Concerned Scientists, accessed May 2008. ↑ "The Facts", America's Power, accessed May 2008. ↑ 6.0 6.1 "Texas, Wyoming lead in emissions", USA Today, June 2, 2007. ↑ Wyoming's Carbon Footprint, eRedux, accessed May 2008. ↑ "Coal Camp Photos", Wyoming Tales and Trails Featuring Photographs and History of Old Wyoming, accessed May 2008. ↑ Big Coal Carriers Navigate a Risky Climate Track, New York Times, September 16, 2009. ↑ Bank predicts bright future for Wyoming coal under cap-and-trade, Erica Peterson, West Virgina Public Broadcasting, November 30, 2009. ↑ "Wyoming coal production down 8.5 percent" Associated Press, June 18, 2010. ↑ "Study says Northwest can quit coal power and save money" Dustin Bleizeffer, Trib.com, July 29, 2010. ↑ "Fossil Fuel Extraction and Western Economies" Headwaters Economics, April 2011. ↑ "BLM denies request to change coal leasing process" Mead Gruver, February 8, 2011. ↑ "Environmental groups sue BLM over coal leases in Wyoming" Jeremy Fugleberg, Casper-Star Tribune, August 24, 2011. ↑ "Environmental groups sue over Wyoming coal lease" Jeremy Fugleberg, Casper Star-Tribune, December 6, 2011. ↑ "From Wyoming With Love" Sparki, It's Getting Hot in Here, May 29, 2012. ↑ "Coal protest movement hits Wyoming" Jeremy Pelzer, Casper Tribune, May 17, 2012. ↑ "Anti-coal group nixes Wyoming protest" Jeremy Fugleberg, Casper-Star Tribune, July 6, 2012. ↑ Coal protesters occupy state Capitol" Associated Press, August 13, 2012. ↑ "Coal protesters arrested at capital" KXLF.com, August 13, 2012. ↑ "23 Arrested in Fight to Stop Coal Exports" Nick E. Ecowatch.com, August 20, 2012. ↑ "Gov. hopeful for Australian partnerships" Dennis E. Curran, Wyoming Business Report, March 25, 2010. ↑ "Univ. of Wyoming scientists launch major carbon storage research project with federal grant" Associated Press, August 18, 2010. ↑ "CO2 sequestration isn't practical" Michael Economides, Casper Star-Tribune, February 20, 2010. ↑ 30.0 30.1 "GreatPoint Energy announces coal supply partnership with Peabody Energy and enters into agreement to build natural gas manufacturing facilities in Powder River Basin", "GreatPoint Energy" press release, January 25, 2008. ↑ "Peabody Energy acquires equity interest in GreatPoint Energy", "Peabody Energy" press release, January 25, 2008. ↑ "Wyoming prepares to plug CBM wells in rugged terrain" Dustin Bleizeffer, June 14, 2010. ↑ "High Plains Gas Announces Reactivation of Fitch Coal Bed Methane Field" MarketWatch, September 29, 2011. ↑ "Tennessee plant closure dents Powder River Basin coal demand" Jeremy Fugleberg, April 23, 2011. ↑ Dustin Bleizeffer,"Coal lobby suggests tax breaks," Star Tribune, November 1, 2008. ↑ Funding boosts carbon sequestration Boomerang, March 18, 2010. ↑ "Wyoming sues EPA over greenhouse gas regulations" PowerGenWorldWide.com, February 16, 2011. ↑ "Governors call for clean-coal funding," Associated Press, February 23, 2009. ↑ "Judge OKs deal on "haze" pollution in West" Associated Press, Chron.com, September 30, 2011. ↑ "Wyoming Set to Lose a Mine of Federal Funding" Damian Paletta, Wall Street Journal, July 4, 2012. ↑ "Federal Court Rejects Challenge to 400 Million Ton Coal Lease on Public Lands" EcoWatch, August 1, 2012. ↑ Dustin Bleizeffer, "Coal producer plans reduction," Casper Star-Tribune, January 7, 2009. ↑ "U.S. Coal Reserves and Surface Mines", Montana Coal Council, accessed October 27, 2009. ↑ "Peabody sends PRB coal to Europe, eyes new W Coast port" Liezel Hall, MiningWeekly.com, October 19, 2010. ↑ [http://wyofile.com/2011/09/ge-wyoming-coal-could-be-converted-to-shirts/ "GE: Wyoming coal could be converted to shirts" Dustin Bleizeffer, WyoFile, September 16, 2011. ↑ 52.0 52.1 "Bulk cargo terminal planned in Washington state" Seattle Times, March 1, 2011. ↑ 54.0 54.1 "Port of St. Helens potential candidate for coal export to Asia" Scott Learn, The Oregonian, June 15, 2011. ↑ "CB could become coal port again" Gail Elber, The World, July 23, 2011. ↑ "UW seeks air permit for coal research facility" Bloomberg Business Week, June 7, 2010. ↑ "$100 million Wyoming clean coal plant suspended" Business Week, July 29, 2011. ↑ "New Coal Power Plant Goes Online Near Gillette" Matthew Brown, Associated Press, April 1, 2010. ↑ "Generating controversy" Barbara Soderlin, Rapid City Journal, March 28, 2010. ↑ "Wyoming commission approves utility rate hikes" Associated Press, May 15, 2010. ↑ "Eco-groups fight coal mining in Mont.-Wyo. basin" Matt Brown, Associated Press, April 6, 2011. ↑ "BLM to sell rights to 400M tons of Wyo. coal" The Associated Press, January 27, 2012. ↑ "Wyoming coal lease sales top 1 billion tons since May 2011" Steel Guru, March 10, 2012. ↑ "Cloud Peak Energy to send more Powder River Basin coal to Asia" Jeremy Fugleberg, Star-Tribune, June 15, 2011. ↑ "With record bid, Alpha wins battle for Powder River coal in Wyoming" Jeremy Fuglebert, Star-Tribune, August 18, 2011. ↑ "Groups File Suit over Largest Coal Plans Ever Approved by U.S. Interior Department" WildEarth Guardians, May 2, 2012. ↑ "Cloud Peak buys Powder River Basin coal assets for $300m" Idéle Esterhuizen, Mining Weekly, July 2, 2012. ↑ "Contractor killed at northeast Wyoming coal mine" Mead Gruver, Business Weekly, September 2, 2011. ↑ "Wyoming Coal Ash Factsheet" Earthjustice, accessed November 16. 2011. ↑ "Black Hills to shutter some coal-fired plants" Associated Press, August 6, 2012. ↑ "Coal Production and Number of Mines by State, County, and Mine Type, 2010" U.S. Energy Information Administration (EIA), 2010. ↑ Major U.S. Coal Mines, Energy Information Administration, accessed May 2008. ↑ "Undeveloped coal mine sold" Associated Press, July 5, 2012. This page was last edited on 16 March 2015, at 20:33.